Looking for ideas for an awesome party or event? Allow Renaissance Adventures to Exceed your Expectations! We at Renaissance Adventures are actors, storytellers, writers, artisans, students of history, blacksmiths, martial artists, dancers, and (we like to think) masters of creativity. If you have an idea for an event, or would like to mix and match our various skills, we welcome the opportunity! 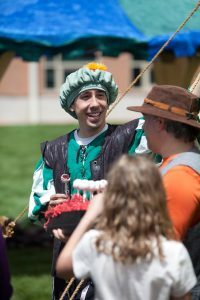 In the past, Renaissance Adventures has hosted Art and Adventure Quest, adult team-building adventures, challenge & ropes course quests, science-fiction quests that teach technology, and many others. For instance, students that have been taught Arthurian legends can participate in our learning-based quest where the kids dress in period clothing, eat an authentic medieval feast, and embark upon a quest that is solved by those who remember their lessons. Other groups that study Native American history have enjoyed our storyteller’s Native American tale of Coyote and the creation of thunder and lightning. Please contact us to brainstorm the next great endeavor with Renaissance Adventures. Please call us at (303) 786-9216 for specific pricing to suit your custom event. $140 the first hour, $80 per hour afterward. Each Quest Leader beyond the first costs an additional $80 per hour. One Quest Leader is needed per 6-20 participants, depending upon activity type. Additional fees may be needed for add-ons, setup, or travel.